This wonderful book has been justly recognized for its importance. It won first place in the Templeton Enterprise Award 2007. Foreign translations are stacking up. And just in time: in theological circles, the soft-Marxist analytics of the old days have yet to be displaced. The author here examines this paradigm of thought against sound economic teaching, using the Austrian School in particular as his framework. 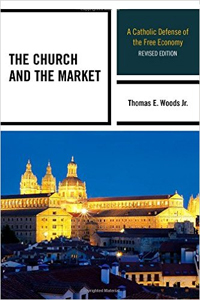 In fact, Thomas Woods's book on Catholic social teaching surpasses any other book ever published in this genre. Rather than merely recount what has been said, he subjects the corpus to a relentless examination, highlighting contradictions and missteps, while praising the good. Even for those not particularly interested in Catholic teaching, this book is an outstanding elucidation of economic science in light of moral concerns. He covers wages and labor, money and inflation, trade and the division of labor, entrepreneurship and development, and the meaning of a range of concepts such as price and value. Of particular interest is Professor Woods's primary target: not so much the social-gospel left but the Catholic right, which argues against free enterprise and laissez-faire with surprising intensity. By taking on these critics of the market, as versus easier leftist targets, he has set for himself the most difficult task of providing a corrective concerning economics to those who are most attached to Catholic teaching on faith and morals and yet are dogmatically attached to various forms of government intervention designed to shore up morals and faith. He shows that market economics is not contradicted by binding Catholic teaching but rather supported by it. Professor Woods is as skilled an interpreter of Mises, Reisman, Rothbard, Menger, Hayek, and others as he is of Leo XIII, Pius X, Pius XII, Paul VI, and John Paul II. His reading of the relevant documents stretching back more than a century--and his careful explanation of their status as official teaching--is a model of fairness and disciplined commentary. He avoids the error of filiopietism that too often afflicts such efforts, but neither does he dismiss the moral concerns that underlay such social teaching. The result is a book that will offer a continuing challenge to anti-market moral theorists on the right and left, and anyone who claims that economic science should be ignored or otherwise dismissed in light of higher ethical priorities. In short, this is the book that pastors and Bishops need to read. There is every indication that the fame of this work is growing such that they will have to read it in order to communicate effectively on the topic. from Jackson Heights "A Profound Philosophical Commonality"